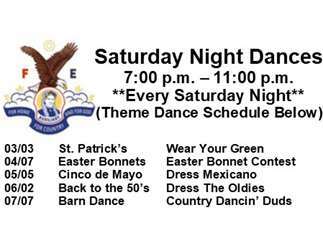 Come and dance to a live band every Saturday Night at the Nampa Eagles! Enjoy good-priced drinks, the best dance floor in the valley, and free popcorn. Everyone is welcome! $7.00 at the door. Membership saves you a $1.00 every dance! The Nampa Eagles are "People Helping People" and we are about fund-raising money to give to local charities! Ask for more information when you're there!